This afternoon I attended the final performance of Portland Stage's production of Charles Ludlam's "The Mystery of Irma Vep." It is no stretch to say I haven't seen an audience enjoy a show this much in years. The laughs, cheers, guffaws and groans emitted from the house served as an almost constant rhythmic counterpoint to the deliriously delicious delivery of the two actors required to play all of the characters in this mystery/horror/camp comedy. Tom Ford (no stranger to either Portland Stage or playing multiple characters simultaneously) and Steven Strafford (making hopefully his first of many appearances with the company) delivered Ludlam's potent cocktail of high and low comedy (replete with horror spoof zingers, wicked double entendres, nods to Shakespeare, Joyce, Ibsen, etc.) making everything feel as fresh and new as when it premiered some 25 years ago: a modern classic. Ford moved breathlessly between the randy peg-legged groundskeeper Nicodemus and the new mistress of the manor, Lady Enid, energy never flagging and a surefooted (even when with only one foot) sense of comic timing that left the audience equally breathless. Wonderfully angular in form and face, Strafford struck a brilliantly delicate balance as he waltzed between the deadpanned Jane (the housemaid in this chamber of horrors) and the manic Lord of the Manor, famed Egyptologist Edgar Hillcrest. He was, in a word, remarkable. Quicksilver costume (and wig) changes and nonstop dialogue at times made it seem like 3 or 4 characters were onstage at once - but nay, it was just this talented pair performing theatre magic. Director, Christopher Grabowski paced the show beautifully, with nods to pop music culture at various points (e.g., Jane's breaking into Melissa Manchester's gooey,"Don't Cry Out Loud," and Lady Enid's energetic "I Feel Pretty" from West Side Story), allowing his actors breathing room (rarely) in a show that barely stops for its intermission. Oh, yeah, the soft shoe number lip-synching Bob Hope & Bing Crosby;s "Road to Morocco" caused near hysteria throughout the house! Greg Carville's ingenious sound design had a Bernard Herman-esque film score quality (indeed, the theme from Pyscho makes a vivid and appropriate appearance) as well as endless rumblings of the storms that seem to eungulf the haunted estate of Mandacrest. 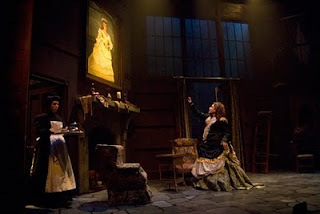 Lighting by Christopher Studley was as quick to change as our actors, fog rising here, the brilliance of a full moon filtering through the French doors of the drawing room, and a hilarious dimming and brightening to signify Lady Enid's seeming passage into madness. The tin can footlights added an inspired touch - and well used by the cast. Anita Stewart created the locales - the Victorian mansion with its balconies, bleeding portraits, hidden torture chambers behind sliding bookshelves, a garden leading to the mysterious Hampstead Heath, and a wildly hilarious send up of the Egyptian horizon with two foot tall pyramids and Sphinxs that moved across the stage as Lord Edgar and his guide cross the desert in search of a tomb untouched by human hands since its sealing. 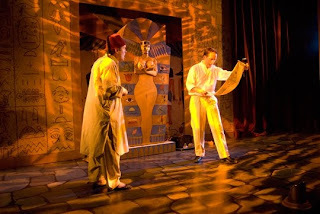 At one point the stage curtain lowered almost to floor level as our bumbling pair navigate on their bellies through a "dangerous" crawl space to gain entrance to a resplendent tomb chamber with elaborate sarcophagus. Beautiful! Loyce Arthur's costumes captured everything fun about this era, particularly Lady Enid's over elaborate multi-petticoated, bustled number . . . not to mention a wig I'm sure Maria Callas wore once in Andrea Chenier!